What a difference a month & half makes? Remember what we wrote on December 15, 2018 just 3 days before the December Federal Reserve meeting? We all know what happened in the December 19 Fed meeting. Chairman Powell proved to be arrogant, obdurate and utterly oblivious of the damage he & his “independent” institution were causing. Then the financial markets showed him. In an utter, complete, contemptuous & furious rejection of Powell’s policy, intellect & arrogance, the US stock market inflicted carnage on the portfolios & net worth of the American people. The tsunami of selling made December 2018 the worst month in stock market history since the Great Depression. How shaken was Fed Chairman Powell by what happened? The carnage told him how little he knew & how much the Fed’s power had gone to his head. And he got religion. Witness his performance in this past week’s Federal Reserve meeting on January 30. It was as if we saw a totally different Powell heading a totally different Fed to paraphrase the venerable Art Cashin of the New York Stock Exchange. Judy Shelton, a noted economist, said she was struck by Powell’s humility during the press conference. What other institution in America has the destructive power to cause this much harm to & instill so much fear in the American people. No one but the “independent” Federal Reserve. Supporters & those dependent on the Fed’s mercies defended Chairman Powell by saying he was new to the job and needed “seasoning”. Ask yourselves, would you make this excuse for a surgeon who inflicts damage on your body during an operation? No. That “unseasoned” surgeon would be held liable & suffer the consequences. No head of a US Government agency would be allowed to get away with this “needed seasoning” excuse. They would be fired. But the Chairman of the Federal Reserve cannot be fired by the President of the United States. Because the Fed is an “independent” institution that only reports to the Congress, they face no oversight.That is why Chairmen of the Federal Reserve keep inflicting carnage & destruction on the American economy and the American people. Chairman Greenspan did it in 2000, Chairman Bernanke did it in 2007. Both busts inflicted enormous financial damage on the American people and sent the US economy into a nasty recession. Now, Chairman Powell has done the same before our eyes. How does an institution make the same ginormous mistake three times in less than two decades? The answer is simple – Corruption. We all know the saying absolute power corrupts absolutely. What we see at the Fed is that Semi-Absolute power corrupts Semi-Absolutely. The corruption at the Fed is the corruption of unbridled academic arrogance combined with zero fear of being held responsible. How else does an institution with over 600 Ph.D. economists keep making the same incredibly damaging mistake again & again? Because they all think the same in their ivory tower; they all play with computer models and pretend they know what will happen in the real world. No wonder they make the same mistake again and again. So why we do use “semi-absolute” term instead of absolute to describe their total independence from any oversight? Because the financial markets exercise the final oversight on the Fed. When the Ph.Ds at the Fed make a huge mistake & when the Fed chairman “needs seasoning”, the financial markets cause carnage & destruction and force the Fed to change their tune as Powell did in January. The tragedy is that the American people & the American economy suffer the consequences of the Fed’s mistakes and the market’s retribution. So how do we solve this or at least begin to solve this? Back on June 22, 2013 during a similar carnage inflicted by Chairman Bernanke, we had proposed that the Next chairman of the Federal Reserve be a Bond Trader instead of an Economist. Our first choice was Stanley Druckenmiller, the famous & famously successful macro investor. He has said that much of his success was because he realized the Fed was about to make a huge mistake and positioned his portfolio to benefit from it. Listen to the first 1:40 minutes of what Druckenmiller said on December 18, 2018, one day before the huge mistake by Fed Chairman Powell in his Press Conference on December 19, 2018. What might have happened had Stan Druckenmiller become the Chairman of the Fed? We feel sure that he would have prevented the growth of the “everything bubble” from 2014 to 2017. 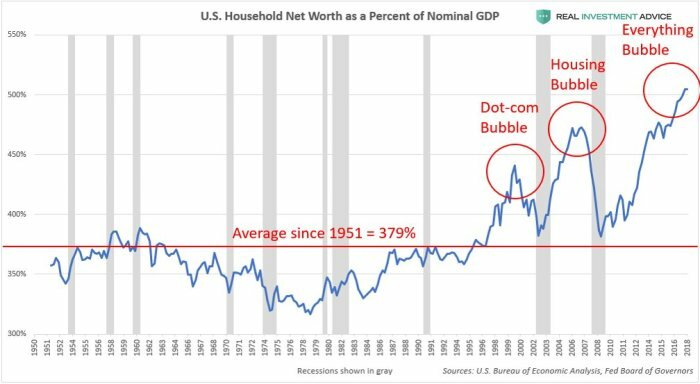 And had that bubble not grown so big, there would have been no need for the mistakes of the Powell Fed in 2018. We still believe having successful bond traders in the Federal Open Markets Committee is extremely important. But it does not address the full problem of the Federal Reserve. The Federal Reserve establishes interest rates, the over night interest rate in US banking. All other interest rates that affect the finances & economic well being of the American people are based on this Federal Funds rate – mortgage rates on home loans, car loan rates, rates on certificates of deposits. So the Federal Reserve touches & governs the financial well being of all Americans. Yet, the American people have no representation on the Fed. The American people elect their President, their Congressional Representatives and their Senators. The Treasury Secretary, appointed by the President, is answerable to the President and responsible for the Economic Policy of the US Government. But the Treasury Secretary touches the lives of the American people far less than the Fed Chairman. And the Treasury Secretary can be fired by the President. But the Fed Chairman cannot be fired by the President and the Fed Chairman can retaliate against the President for verbal criticism by raising interest rates & harming the economy. In fact, Fed Chairman Greenspan is believed to have kept interest rates as retaliation against criticism by President Bush (senior) and caused his defeat in 1992. This “independence” of the Fed might have been useful a hundred years ago but today it is a dangerous anachronism. This “independence” is what makes the 600-odd Ph.D. economists at the Fed so arrogant of their power and so contemptuous of the American people and the President. This cannot go on, in our opinion. The Fed needs a strong dose of diversity and transparent public discussion about the Fed’s decision making. The Fed also needs to work together with the elected representatives of the American people in establishing policies that affect the American people and the economy. So we propose that the Federal Open Markets Committee (“FOMC”) have, by congressional act if necessary, one representative of the President & one representative each from the House & Senate Financial Services committees. Our immediate choice is Larry Kudlow as a representative of President Trump. That is easy to explain & justify. We don’t have a specific representative in mind from the Senate Committee. What about our choice of the representative of the House Financial Services Committee? Back on November 10, 2018, we thought about Maxine Waters, now Chairwoman of the Committee. As the new Chair of the powerful House committee, being one of the many members of the FOMC may seem infra dig to Chair Waters. And her style seems to be more suitable for ruling instead of proposing. That is why we think Alexandria Ocasio-Cortez should be the representative of the House on the FOMC. Just think! Who would be better at articulating the impact of interest rates on the middle class, on millennials? Who would be better in ridiculing the Ph.D. staff of the Federal Reserve for their insularity & arrogance? Just think of the common ground between Larry Kudlow & Ocasio-Cortez. It would be a powerful team indeed. So what would this new & improved FOMC look like? A Fed Chair & a Fed Vice Chair (one of these to be a bond market professional), Fed Governors and three representative of the American people – from the Executive Branch, from the House and from the Senate. It would still remain an independent committee but a diverse one with inputs from all expertise-holders & stakeholders – economists, bond market professionals and the people’s representatives. Now this new & improved FOMC might still mistakes but they will be combined mistakes of the people & the experts instead of the mistakes of the insular, arrogant academic aristocrats.